While I had one more full day to spend in the Kyoto area, I opted to take a day trip to Miyajima rather than stay in Kyoto. I figured that since I had the Japan Rail Pass, I might as well use it to see as much of the country as possible. Trains from Kyoto to Hiroshima run frequently and take less than two hours. I switched at Hiroshima to a more local line (Sanyo Main Line), which took me to Miyajimaguchi, the closest trainstation for Miyajima, in about half an hour. Miyajima is an island just off the coast of Honshu, Japan’s main island. 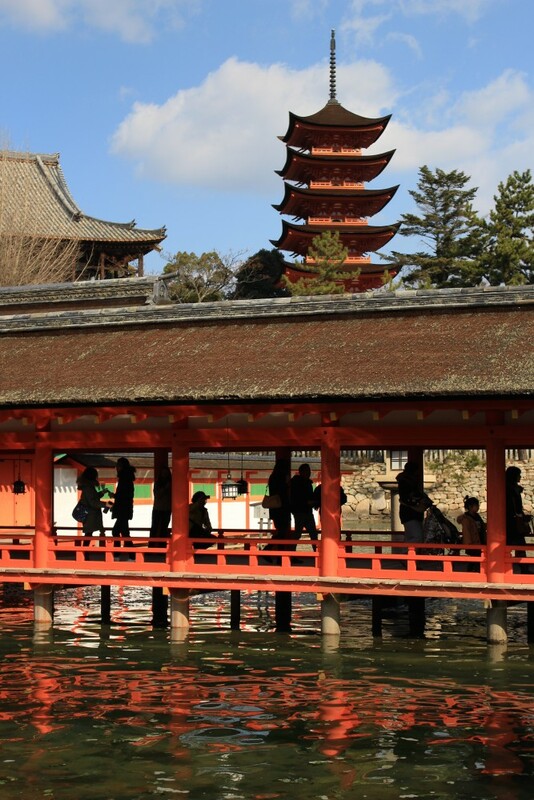 The island is officially known as Itsukushima, but locally it’s more familiarly referred to as Miyajima. The island is one of the most popular tourist destinations in Japan, and it’s easy to see why. 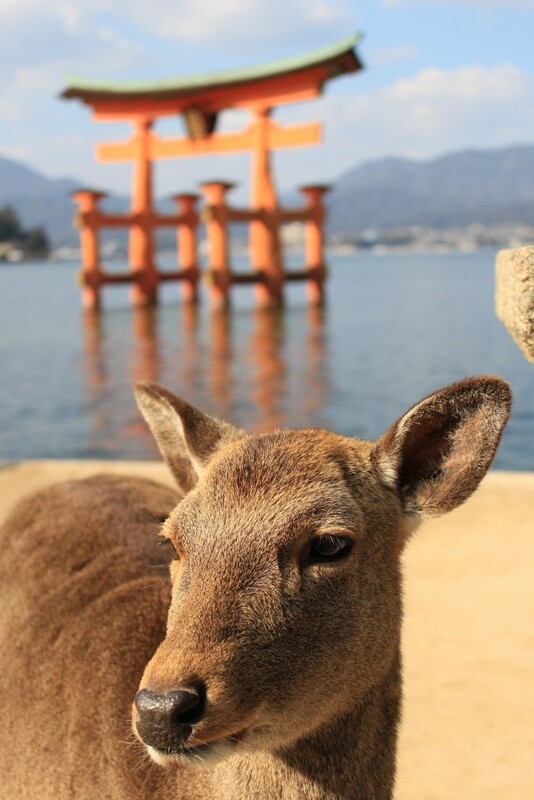 Between unique shrines, local shops and delicacies, and the wild deer that have free reign over the town, there’s a lot to see on a day trip to Miyajima. The island is easily accessed by frequent ferries. 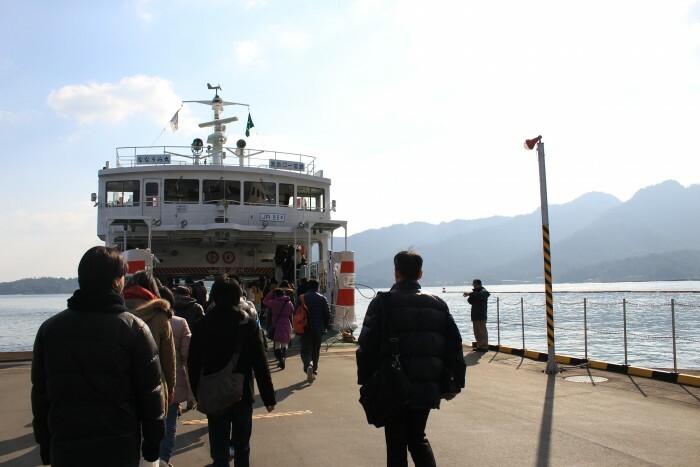 There are two different companies that run to Miyajima, one of which is run by JR, so if you have the Japan Rail Pass, you’re covered. One tip: If you want to take photos and get the best view across the water toward Miyajima as you arrive (or depart), stay on the car deck. On both of my trips, there were no cars, and all of the people went up to the passenger deck. I had the entire car deck to myself for the 1o minute ride. Once you arrive on the island, all of the sights are to your right, heading southwestward along the coast. 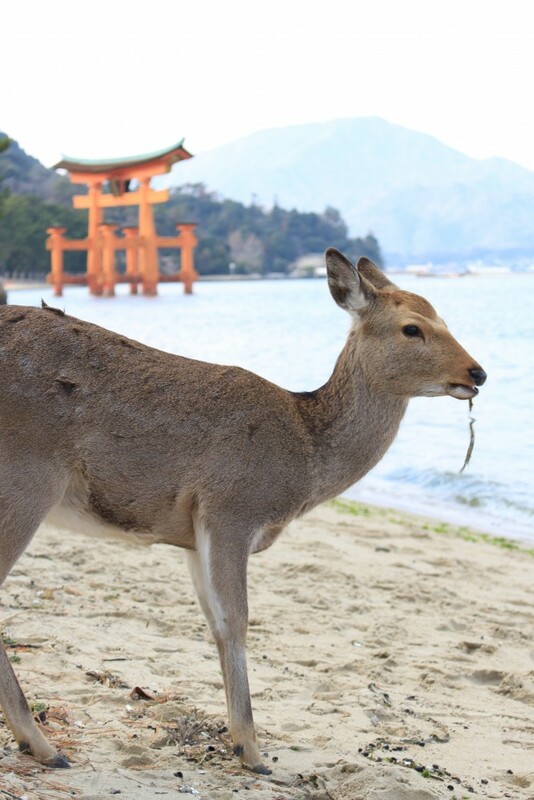 It’s unlikely that you will go much further than the open space outside the ferry terminal before seeing Miyajima’s most famous residents: wild deer. In the Shinto religion, deer are considered sacred messengers of the gods. As such, they do pretty much whatever they want. They’ve grown quite accustomed to tourists and the bounty that comes with their presence. There are signs up saying not to pet the deer (which I admittedly missed prior to petting several deer… oops) as well as not to feed them. The deer can’t read the signs, so they have no issues with taking things from humans, both those who are willing and those who are unwilling participants in the exchange. 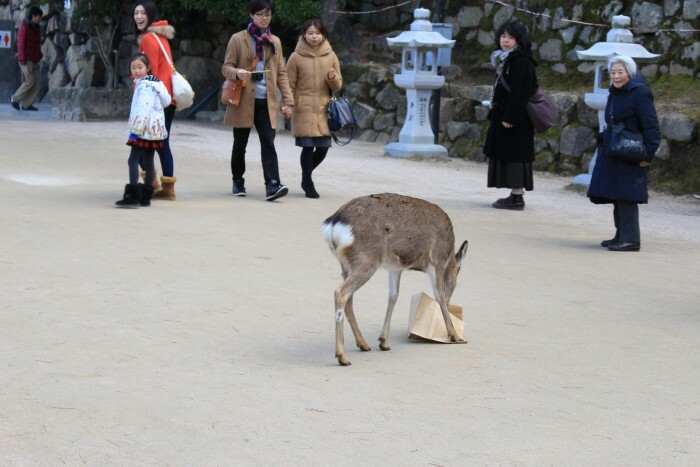 One of my favorite parts of my day trip to Miyajima was watching deer outsmart humans who just would not grasp that the deer wanted whatever food they had on them. I witnessed several people chasing after deer who had stolen their belongings. I didn’t join in the pursuit because as far as I’m concerned, if you’re getting outsmarted by a deer, you’re in that all by yourself. I saw one woman with a stroller who kept standing there as deer tried to get into her bags. You’d think she would have gotten the hint that maybe she should move on somewhere else away from the deer, but nope, she just kept standing there like well, a deer in the headlights. 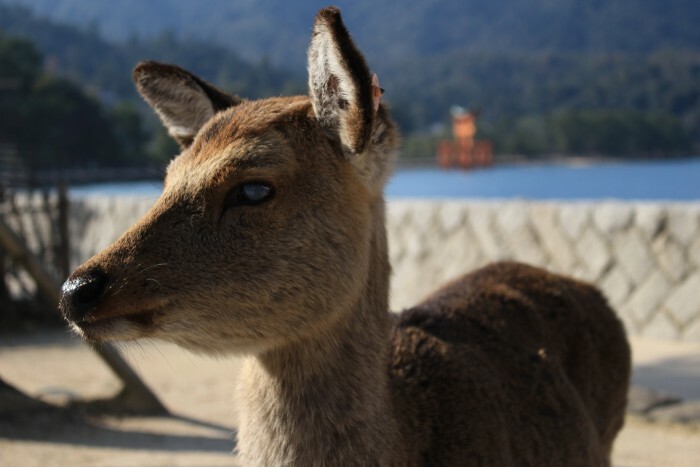 I did have mixed feelings about the Miyajima deer. While it’s nice seeing nature, it’s hardly a natural environment. The deer don’t seem to be in the best health, most likely thanks to their unconventional diet. They are completely reliant on humans, which is never a good thing. For being such sacred creatures, there has to be some better way for them to live. Passing by more deer, I reached Itsukushima Shrine, one of the most beautiful and unique Shinto shirnes in all of Japan. In fact, it is one of the Three Views of Japan, a set of sights deemed to be the most scenic in the country. 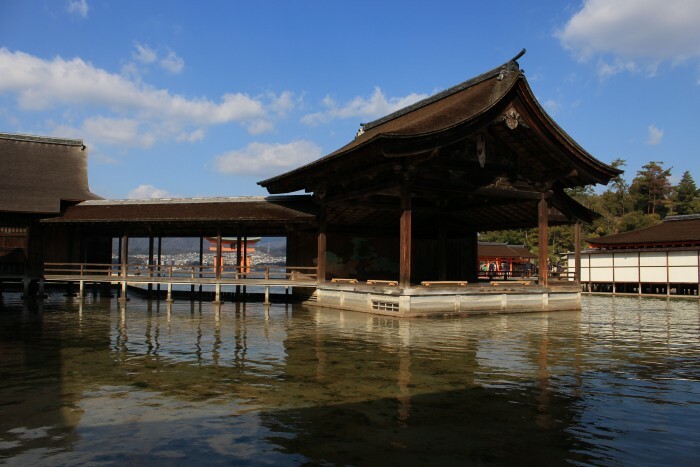 Itsukushima Shrine is also a UNESCO World Heritage Site. 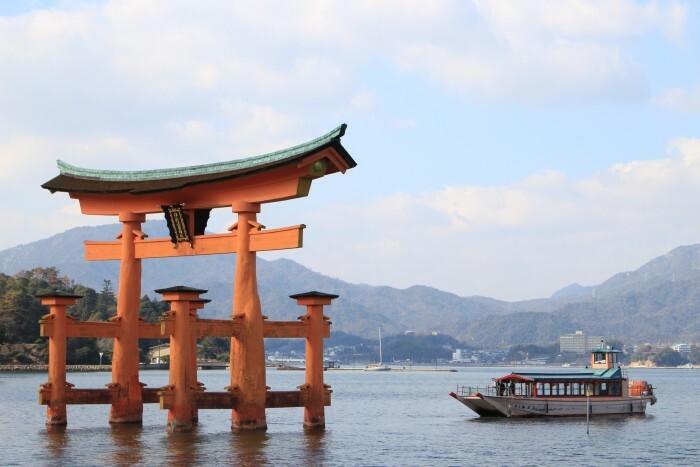 The most photographed part of Itsukushima Shrine is that torii gate that sits in the water outside the complex. When the tide is high, the gate appears to be floating in the water. When the tide is low, it’s possible to walk out to the gate. I arrived within an hour of high tide, so I was able to see it in its floating state. 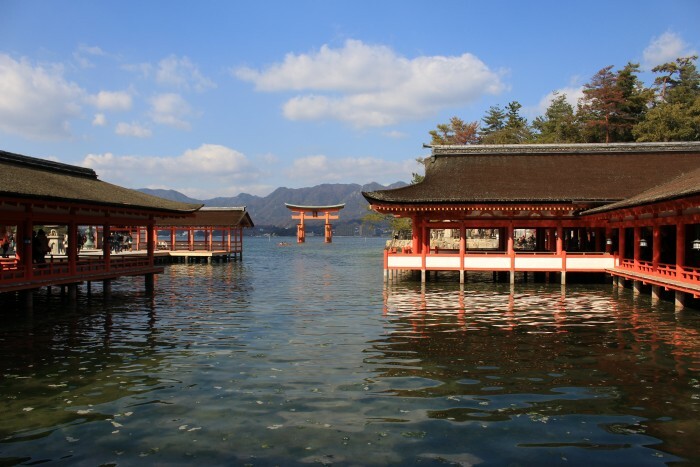 In addition to the floating torii gate, the rest of Itsukushima Shrine also sits just above the water. Several buildings rest on piers that are accessed across a series of wooden bridges. It’s a peaceful connection between the shrine and the water, and it’s impossible to not see new and interesting views each time you turn a different direction. It was my favorite shrine I visited in Japan, both for the tranquility (despite some crowds in places) and for the photo opportunities afforded there. As you leave Itsukushima Shrine to the west, the crowds thin out. There are some small museums and shops in this area. Looping back toward the ferry terminal, heading north there are more market stalls. 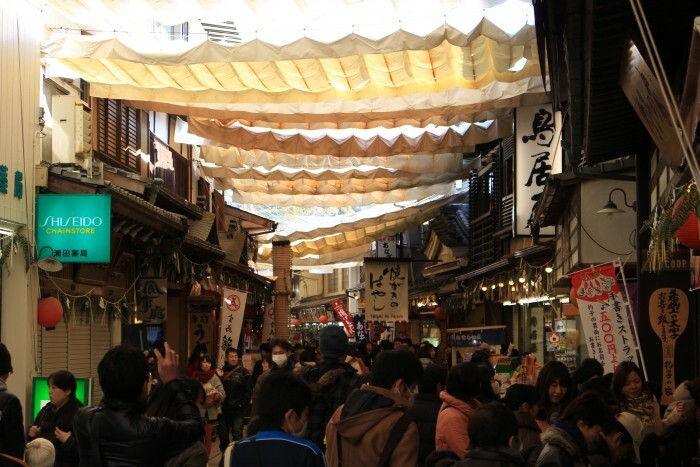 While the shops and food stalls of course cater to the large tourist trade, many of them feature items that are unique to Miyajima. 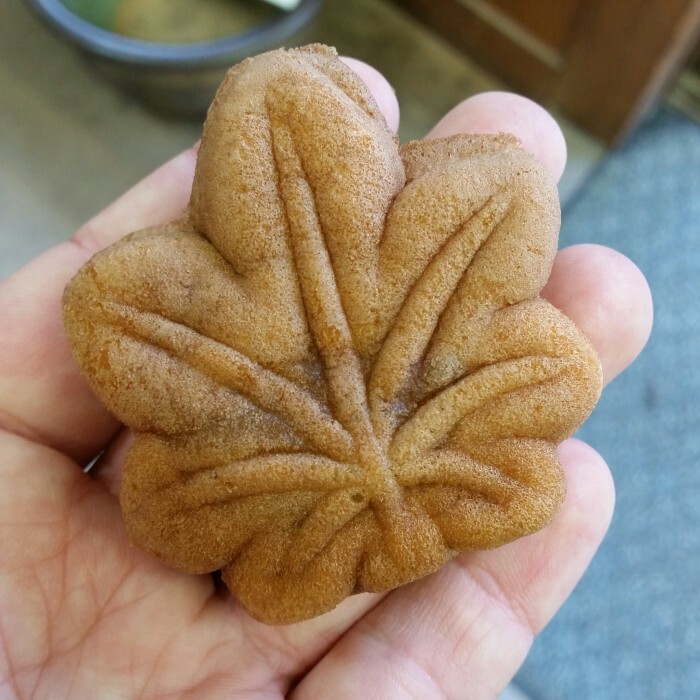 One of these is Momiji Manju, a maple leaf-shaped filled cake. The cakes can be filled with red bean paste, sweet potato, green tea, chocolate, or other fillings. While they are fantastic fresh, they’re also available in gift boxes to take back home as a souvenir. Since they’re individually wrapped, they were perfect for taking back to friends. After I had some snacks, I finished walking through the rest of the market, passing by another of Miyajima’s claims to fame: The World’s Largest Spatula. 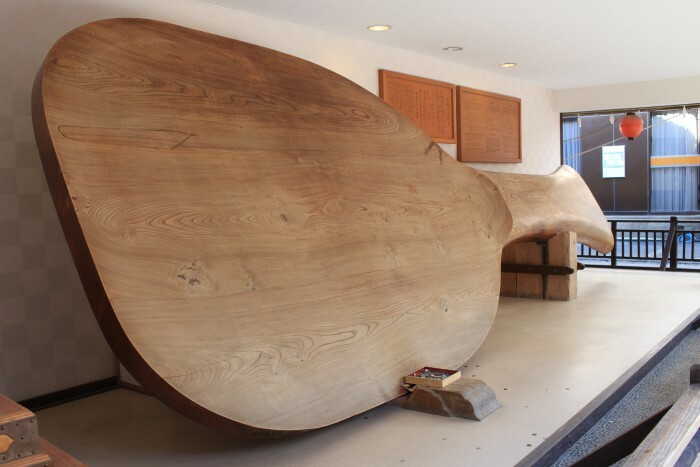 Yeah, that’s one large spatula. I don’t know why it exists, or why it’s in Miyajima, and quite frankly, I’m happier not knowing. It’s better that some things remain a mystery. Day trip to Miyajima complete, I retraced my journey through town and headed back toward Hiroshima.